Although you may be tempted to change the look of your car, there are instances where you should probably think twice. Sure, most of the time a vinyl wrap is a great idea for a car. With the right maintenance, professional design team, and a fun idea, your wrap can make you the talk of the town. However, sometimes you may get a wrap done professionally and well, but it still won’t look right. This may not be the fault of the company, but yours due to wrapping a car that simply shouldn’t be vinyl wrapped. Can My Vinyl Wrap Be Applied to a Rusted Car? To put it simply, no. 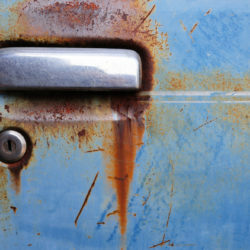 Rust not only jeopardizes the structure of your vehicle but covering it up will trap moisture inside and continue to spread the problem across the car. Not only that but when you apply vinyl to a vehicle the main adhesive works on paint. If the paint is chipping or not secured on your car, then you wrap will not stick around for long. The only solution to getting a car wrapped installed from rust is to eliminate the source of your rust problem and prime the affected area. Rust isn’t the only culprit to a great vinyl wrap job. Some issues may appear small but can easily prevent you from getting a polished look once the job has been completed. Although vinyl will adhere to cars with scratches on them, it is not recommended that you take the steps toward application until the scratches are repaired. Scratches and similar defects are only going to be even more visible when the wrap is installed. On top of that, should you decide to remove the wrap, you could be compromising the paint job around the affected area. If your last paint job had too much paint applied on it, you most likely are experiencing the ‘orange peel’ look on your vehicle. While it may seem like a great idea to simply cover this botched job up with a wrap, it will once again magnify the effect and just look wrong. If you are going through this issue, get the paint job repaired properly, let the paint settle and then apply a wrap. It is best to check with a professional to ensure that the paint will not be compromised upon removal. Not all of us are car experts, so it is important that if you are thinking about getting a car wrap, that you plan ahead. Reach out to a local wrap company and make sure that your car is in wrapping condition. It is always better to be safe than sorry. If you know that your car is in good condition but just needs a new look, then look no farther than SkinzWraps, Inc. for a fresh, vinyl wrap. We know that you love your car and giving it a little flash makes you feel good driving it. Contact us today to find out how to schedule your next vehicle wrap or to check if your car is eligible for our services.